Gold prices rally to their highest level since June after surging more than 1.4% during Friday's session to close above the $1300 level. The bullish move came after reports that stated that Fed officials were considering an early end to the balance sheet reduction scheme. Although the initial market reaction was relatively muted, American investors seem to be pricing a more dovish Fed at the moment putting the greenback under huge pressure with investors also shifting focus to geopolitical tensions. As expected, Gold prices headed towards the higher band of the flag and broke above it to confirm the continuation of the general uptrend. The price is currently hovering just below the $1302 level forming a consolidation after surging 1.4%. The RSI points towards a strong momentum but overbought conditions are there and if we notice we can see huge divergences between the price and the momentum on bigger time frames. 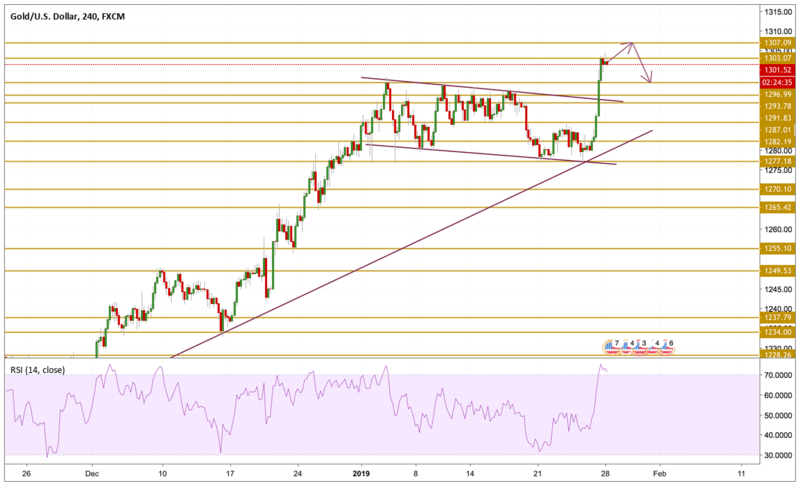 However, we believe that the price has a bit more room to continue the upward move before we can expect a technical correction, that is why we will be focusing on the $1307.09 resistance level.